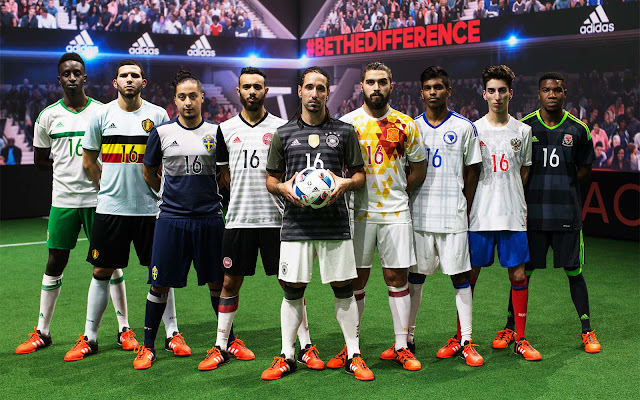 With this summer's Euro 2016 tournament kicking off in less than a month, we take a look at all of the shirts designed for the 24 nations competing in France. In part 1 of 3 we take a look at the first two groups, featuring the host nation and seven other countries. 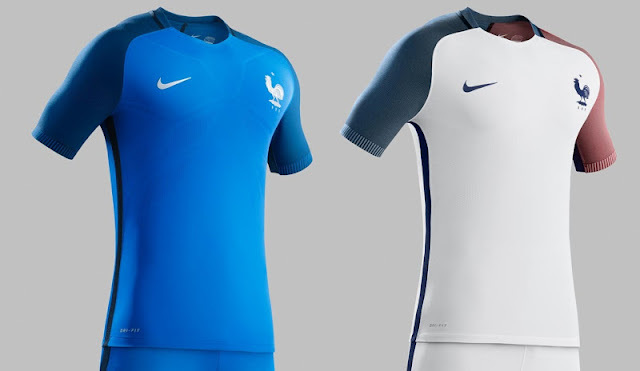 Host nation France's kits are pretty different from the nation's usual look. The two tone blue on the first kit and the different colored sleeves paying homage to the country's flag on the alternate shirt are a nice touch by kit manufacturers Nike. That said, other than the two previously mentioned features France's shirts still have a strong templated feel about them. I apologize in advance to the many countries that identify with these same 3 colors, but as far as sports apparel design is concerned the combination of yellow, red and blue is as terrible as it is common and Romania's shirts designed by Joma are a perfect example of that. Some manufacturers manage to work around this problem by working with very specific shades of these three colors, as seen in the past with Colombia's top notch kit in 2014. But that was obviously not the case for the designers at Joma as they managed to put together what is one of, if not the worst shirt design of Euro 2016 with this boring (and frankly ugly) design for Romania. A tale of two worlds; in one, a "home" shirt that is almost an exact copy of an Adidas template (see Sweden kit in part 3 of this feature), but perhaps made even worst with the white sleeves and Switzerland's need for two crests plus the Puma logo all on the front which makes this shirt just plain awful. 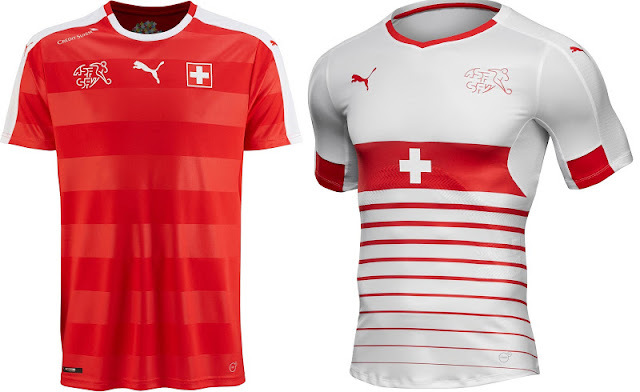 Then, we have the Swiss alternate kit, which looks like the shirt of some awesome ambulance driving superhero. The lines on the lower portion of the shirt along with dropping the white Swiss cross to the middle of jersey frees up space and makes this s solid shirt! Perhaps this design by Macron is not for everyone, but for their first ever appearance in a major tournament the Albanian national team has signed-off on a shirt concept that will stay with viewers for quite a while whether or not The Eagles manage to impress on the pitch. 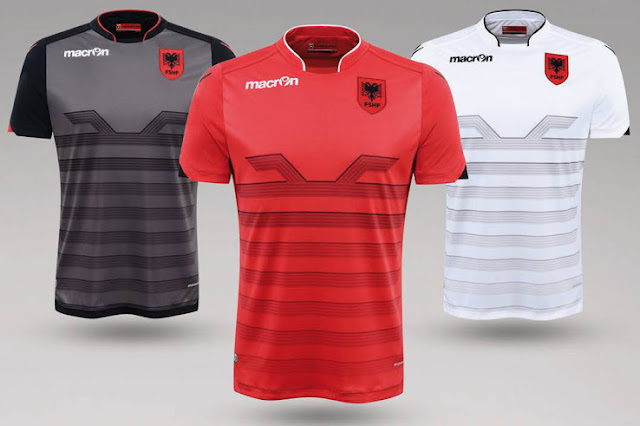 Likely inspired by Macron's recent unique alternate design for SS Lazio in the Serie A, Albania's Euro kits give the nation a unique look. 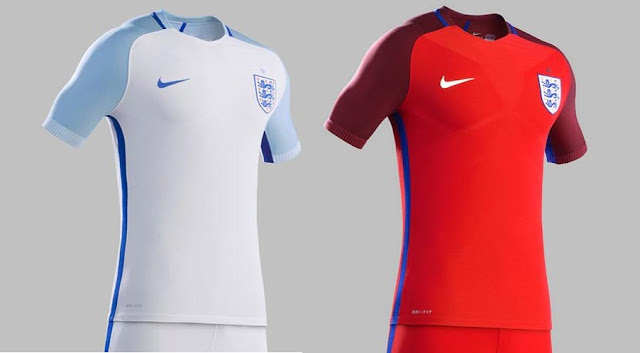 Using the same template as the France kits, England's Nike outfit does have a few unique features despite being pretty minimalistic. The very light blue sleeves on the white kit is a new addition to England's look, while the alternate jersey is red again but with a blue trim rather than the more traditional white. While I don't absolutely hate these England kits I can't help but feel that this would be more appropriate for a Great Britain team rather than England. 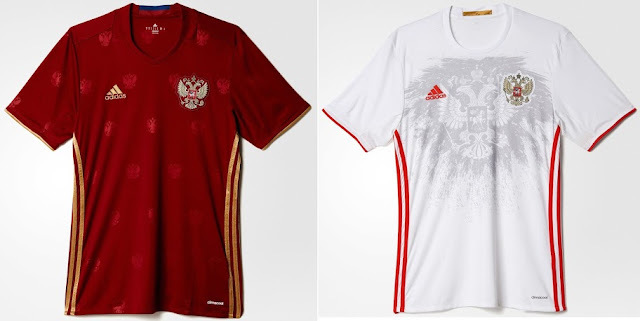 I have been very impressed with some of the previous kits Adidas has been able to produce for the Russian National Team in the past. This time around however, it seems that the designers at Adidas were running out of ideas and simply tried to do too much "creative stuff". I still love the fact that Russia started using the deep red with the gold trim, but this year's shirt looks a bit like a pajama with the tiny crest silhouettes in the background (although it seems that Chelsea supporters should be more upset at this particular design as it seems this same template will be used by the club throughout the 2016-17 season). The alternate kit is another example of misplaced design feature as the grungy looking crest silhouette in the middle of the shirt simply looks like an unnecessary splatter. A nice sharp look for Slovakia courtesy of kit manufacturers Puma. Perhaps the white shirt could have been "tinkered" with just a bit, but the alternate design is a perfect example of how a football jersey can be both simplistic and yet have a unique feel about it with the design feature in the background. The two crests along with the Puma logo make it a bit busy at the chest area, but overall this kit is well designed. 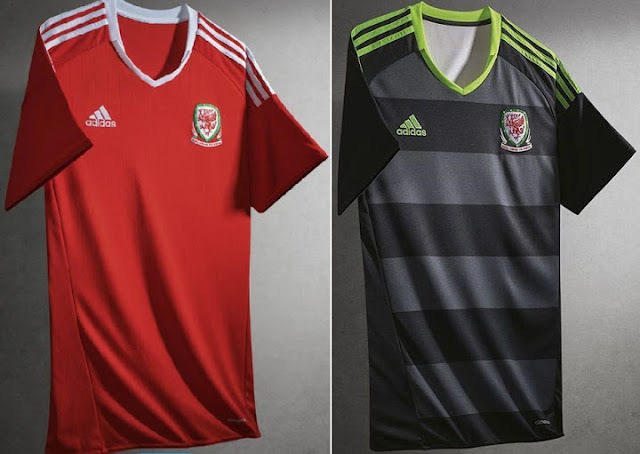 Not much to say about these kits for Wales "created" by Adidas. This is obviously your run of the mill drop a color onto a template type of stuff and the templates used were not great to begin with. Pretty disappointing for a nation that will be playing in their first ever UEFA European Championship tournament final. I like both Slovakian jerseys.